A step back in time when there was a Fire Station in Great Wakering. In 1938 an Act of Parliament moved the responsibility for fire fighting from the Parish Council to the District Council. Rochford Rural District Council wrote to Great Wakering Parish Council to enquire as to the details of their fire fighting equipment and personnel leading us to believe some fire fighting existed in the village before that date, other than the basic fire buckets. No reply from Great Wakering was received so the Rural District Council assumed no equipment belonging to their fire brigade remained. The future plan for the Rural District was to build three new stations one in Rochford which had to have accommodation for two full time firemen and two sub stations, one in Hockley and one in Great Wakering. These would be staffed by two officers and ten firemen. In January 1939 the newly formed Rochford Rural District Council Fire Brigade came into being under the command of Chief Officer Arthur Chapman. Councillor Chapman was a retired London Fireman, Vice Chairman of Rochford Parish Council and Councillor on the Rural District Council. Picture above is the crew and appliance when the station first opened as a Sub Station of Rochford Rural District Fire Brigade. Names of those known are top left Rob Pool, George Walker and Alf Butler. Middle row (sitting) from the left George Bradley, Cyril Bright, Harold Key and Bob Cooper. During the Summer of 1941 every fire station in the UK became part of the National Fire Service until de-nationalisation on the 1st April 1948 when Essex County Fire Brigade took control of all but three stations in Essex: Southend-on-Sea, Leigh-on-Sea and Shoebury. Picture below taken at Great Wakering Fire Station during the National Fire Service days. Names of the fireman in the National Fire Service picture supplied by Roy Richards are as follows from left to right, back row George Stow, Bob Sterry, Ernie Harrington, Fred Thorp, unknown fireman and Richard Burgess. Middle row Fireman Trust, Arthur Wiseman, unknown fireman, unknown fireman, George Bradley, Tom Ebbs, Albert Watson, Bob Cooper, George Walker and John Whale. 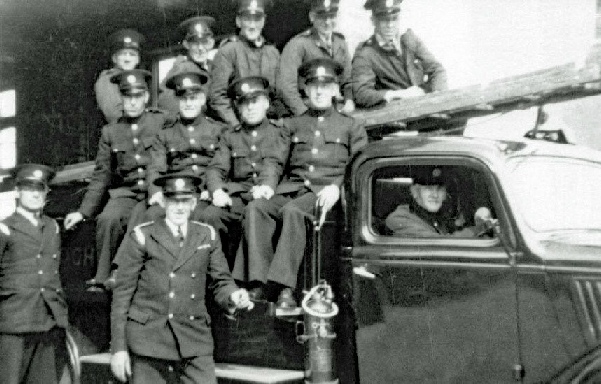 Front row Lice Elden, Fireman Spooner, Fireman Hayward, Rob Pool unknown Officer, unknown Officer, Stan Millbank, George Moss and Fireman Butler. It’s possible where Rob Pool is sitting he would be Section Leader Rob Pool, and Fireman Hayward and Millbank were Leading Firemen. 1955 picture of Great Wakering Firemen attending the children’s Christmas party. This article has been put together with the help and pictures from Roy Richards from Great Wakering, the youngest member of the final Great Wakering crew. Roy is standing on the left at the back of the picture above taken at the children’s Christmas Party in 1955. Next t o him is Fireman James ? John Knight, Les Poole, Jim Smith, Leading Fireman Eric Smith. In the front row are Fireman George Moss, Alf Thorogood, Leading Fireman Nutty Caine (who would take command of the station for the last few months, Sub Officer Rob Poole and Divisional Officer Jones. 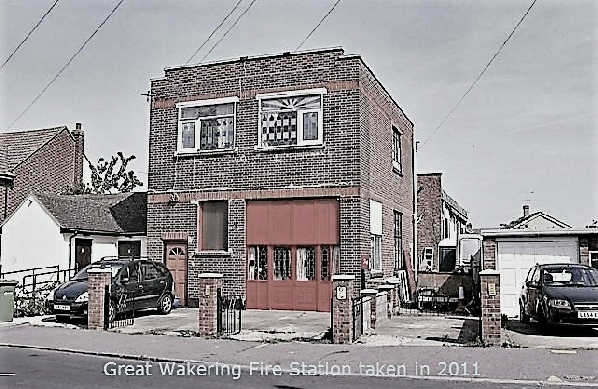 Not long after the party photograph was taken, on May 31st 1957, Great Wakering Fire Station closed down for good. 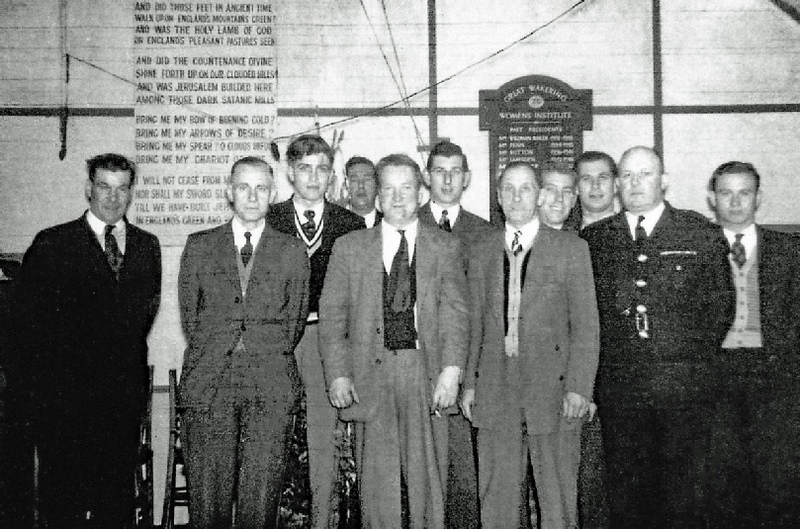 Insets in the main picture are two of the members of the crew not in the photo left Leading Fireman George Bradley and right Fireman George Walker.